​To Participate: Visit (in person or by Skype), call us on (610) 869-4712, or email us. Sasha writes: 'The new moon is a time where the energies of the sun and the moon support new intentions. In the current cultural and political climate, I am concerned about the future as it relates to art and as it relates to women. Street Road experimental artist space's unwavering spirit of inclusion and constant inquiry into the use of land is important to me. For our five-year anniversary, back, forth examines ways independent art spaces make connections amongst a multiplicity of communities. The exhibition traces threads of artistic and social influence connected to our past programming, and seeks to widen Street Road's networks of relationships as we look to the future. Participants in our past projects - artists and audiences - have voiced appreciation for our forum for the exchange of ideas, a space that is at once rooted in our local landscape, but that also fosters connections amongst the local, the regional, the nearby urban, the global. The exhibition starts with 9 works previously presented in earlier exhibitions. These have been selected to present a sense of the breadth of projects we've featured and also because they engage in a close way with Street Road's core subject - examining received ideas about land use, property, and ownership. We invite you to reflect on one or more of these, and to bring or send us your responses for inclusion. A response can take the form of a new work of art, a piece of writing, a related article, a book, a object, or it may simply be a brief note or photograph. ​Everything submitted will be included. All submitted work is online too: Please click the links below: each anchor has a dedicated page with images and details of works submitted in relation to it. Our MAIN reception for back, forth will be held at the end of the exhibition, a celebration of new connections made, new relationships forged, on April 22nd, 2017.
included in The Lay of the Land exhibition – 2011. 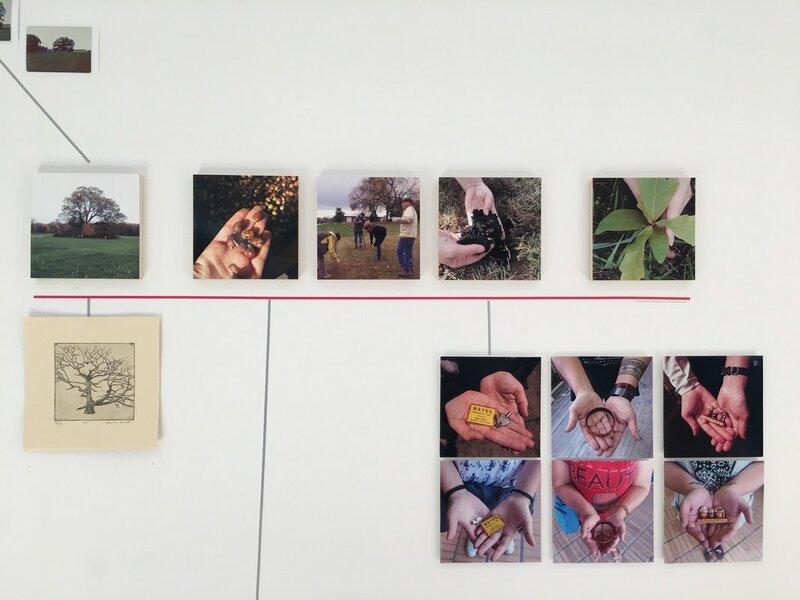 The documentary Par Exemple, Ebenthal considers the relationship of farmers to their home and land in the suburbs of growing cities, drawn from the example of Ebenthal, a suburb of Klagenfurt in Austria. There are strong parallels to our own regional development here in southern Chester County, PA. The Homma Meridian re-sites the Greenwich Prime Meridian at different places around the world, from Paris to Budapest, to our site in Cochranville, PA. Kaori explains the project: "As with the Greenwich Prime Meridian Line, boundaries and demarcations are necessarily a means of orientating ourselves within the increasingly multi-cultural, multi-ethnic social context we face in this shrinking world. However, at the same time these demarcations and boundaries also create tensions and barriers. The idea behind the “Homma Meridian” project is to draw an imaginary line which points to the North and South Pole in a specific location, using ephemeral material, which the artist suggests is a substitute for the “Prime Meridian”. The project highlights the “imaginary” nature of the boundaries that exist in our mind and questions the perception of our position on the earth as it spins on the titled axis eastwards, always spinning away from the west." Julia Dooley is a science educator and artist. Recognizing the pressing need for scientific research to be better understood by the general public, Julia’s practice has a focus on engaging non-scientific communities in science research through art. In 2007 she spent two months in Antarctica photographing, with the idea that sharing this work would help others understand the enormity of the place, and at the same time the purposes and processes of polar research. back, forth presents just one of her images, 'The road out of town', which depicts the edge of the famed McMurdo Station and the edge human settlement and encroachment on the otherworldly Antarctica. Underneath by Hong Kong-based MAP Office (Laurent Gutierrez and Valérie Portefaix) is a documentation of life under a 63-kilometer raised highway loop surrounding the Chinese city of Guangzhou. This sprawling city-inside-the city, which includes hundreds if not thousands of makeshift market stalls and businesses (including an outdoor pool hall and a dance hall) imposes its haphazard logic onto the urban landscape, creating surreal propositions for land use in our emerging global metropolises. Work by the original inhabitants and first nations of our area. Perhaps the co-owners or ultimate owners of our site? These arrowheads were found and have been carefully stewarded over the years by local farmer Phillip Edwards and his brother and father. Open Wall – Street Road Artists’ Space You may have a response to something not included in this anchor list. It could be to our core mission of challenging preconceived ideas of ownership, to something specific you have seen at the site, or to something you've learned through relationships with people who have worked with Street Road. The open wall will be used for any such contributions. In 2014, with the participation of local community members, artist Adrian Barron planted 2,000 acorns collected from the region’s historic William Penn oak trees, at the intersection of Routes 926 and 41 on approximately one acre of Street Road's site. The resulting work, an ongoing growing installation, is an intervention that might stand as a bulwark against development or road expansion. The work combines philosophical concerns central to Barron’s practice with Street Road’s unique context. He writes: "Parts of western Chester County retain a fading air of the rural idyll even as suburbs encroach and the natural topography is altered. Urbanizing tendencies are reflected in and facilitated by developments to the region’s main arterial, Pennsylvania Route 41. Through the communal planting of acorns along the highway, we can create what I call an antipathy to this manmade disruption." 'Chalfont' is a short piece from swishpan, one of the writer's four compilations of short stories and poems. It captures the writer's relationship to a specific and personally significant place here in Chester County – in a voice that is direct and evocative, getting right to the heart of the profound importance of place to our most human experiences. Yerevan, Armenia-based photographer Vram Hakobyan turns his lens to a twentieth century Soviet housing block in Tblisi, Georgia. Residents have taken the regimented, uniform modernist Soviet style and personalized it.